“So why keep following it?” God asks. I sigh again and roll my eyes, getting annoyed with God in the way that you can only get annoyed with someone you really love. “And what does that mean, exactly?” It’s always hard to get a straight answer during these chats. “But what if it takes me fifty rows to realize I’ve made a mistake?” I ask. “And lose everything? !” There is panic in the shrill crescendo of my question. “Thanks,” I smirk. “But why couldn’t you have just made me so I do things right the first time?” By now I have learned not to expect answers to such questions. God begins a new row, and I stare with envy at the perfect stitches. “Perfection isn’t the point, Beloved.” I jump, caught off guard by God’s spoken response to my silent thoughts. God laughs, then hands me the yarn and hook. “Here, you finish it. 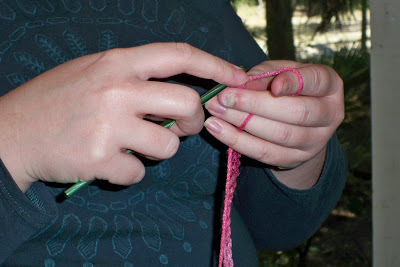 With trembling hands, I loop the yarn over the hook and begin to put it through the next stitch. “But what is it?” I ask. God says nothing. I finish a single crochet and pause. God reaches over to squeeze my hand. “Then one more.” I take a deep breath, and loop the yarn over the hook. Something about this reminds me of The Shack. Many blessings on your shop! The process you describe, instigated by God, sounds just like the creative writing process, and any creative process generally.